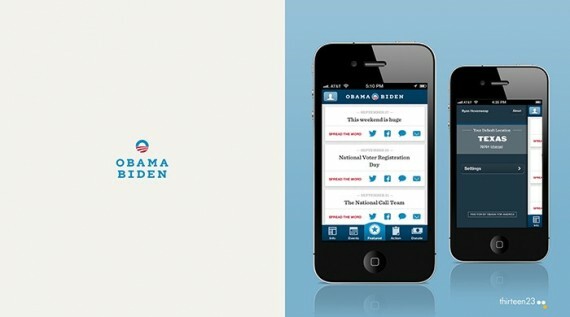 thirteen23 was approached to design and develop the mobile strategy for Barack Obama’s 2012 bid for re-election. Working with Obama for America, the team crafted an ambitious set of mobile applications designed to support Obama’s large base of campaign volunteers and grassroots supporters. Instead of creating a simple brochure application outlining the President’s policies, the team focused on creating a real-time mobile solution to aid campaign organizers and volunteers working in the field. The application, which was part of a larger digital initiative, was completely location-aware, designed to automatically deliver timely information, push notifications, and field directives straight from the campaign’s headquarters to people’s phones. By simply downloading the application anyone could join the campaign, become a field volunteer, collect donations, register voters, or go door-to-door in their neighborhood or community to help get out the vote. By focusing on the campaign’s ground game and decentralizing its canvassing effort, the campaign was able to reach more voters in more communities and increase voter turnout. This allowed the campaign to make strategic gains in a number of battleground states, ultimately securing the President’s re-election. It’s been the science-fiction dream of political operatives for years: an army of volunteers, connected to the Internet as they walk from door to door, looking up names on a device and entering their responses electronically. 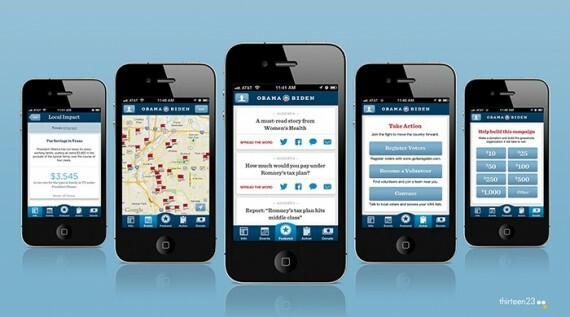 Obama’s campaign [has made it] a reality with the release of a new iPhone app that will replace the ubiquitous clipboard for Democratic canvassers. NYT, July 31, 2012. To achieve this goal we needed to: a) hit the ground running; b) research volunteers’ needs and workflow in the field; and c) deliver a working solution at the most critical time of the campaign–the three months leading up to the national election. Perhaps our largest constraint was executing on the design and development for both iOS and Android in under 60 days. The Obama for America application is the first of its kind. While there have been other applications relating to politics and elections, none have provided a real mechanism or the infrastructure necessary to drive political participation at a grassroots level. Our mobile solution not only lowered the barrier of entry for political activism, thus increasing participation, it also provided the campaign extreme insight into its operatives at every level of the campaign (e.g.,regional,state,local, and precinct). Our project redefined the role of mobile computing in modern day elections. “Another tap produces sample scripts for approaching voters, complete with first names for residents of flagged houses.”Beyond the impact we had on the campaign and its volunteers, this project also provided the administration with a shining example of President Obama’s Digital Government Initiative. Did we mention the application provided real-time maps, location-based data, and support for volunteers canvassing in the field? Read our lips, no more paper, pens, pencils, and clipboards. We’ll work on the phones & batteries. thirteen23 is an interactive design and development firm focused on delivering software for a connected world. We take a user-centered approach to design. Understanding the campaign’s message, its volunteers, and the habits of prospective voters was critical to the success of the project. From the standpoint of human interaction, we were less concerned with coming up with novel forms of interaction and more concerned with bridging the gap between information, people, and communities. We engaged the campaign because we wanted to create an application that encouraged and empowered citizens to actively participate in their local election process. As designers our job is to deliver information and facilitate communication. Mobile computing has the distinct opportunity to increase political participation, to improve government transparency, and to make our elected officials more accountable. By demystifying the political process and making information more accessible, not only can we improve our national, political dialogue, we can also make it more inclusive. What better way to begin than to help re-imagine the political process?